Here's a high-fashion handbag that you can wear everyday! ; Made of fine jacquard fabric with rich patent trim. Holds your wallet, sunglasses, personal technology and a bottle of water. Dimensions: 12 wide x 6 deep x 8 1/2 high. 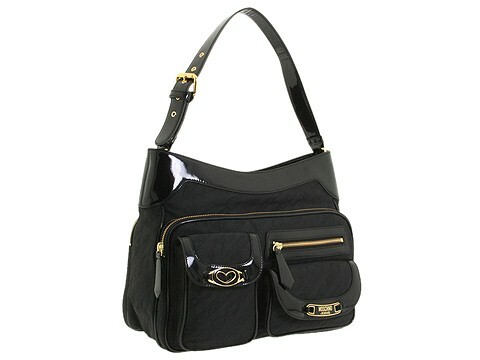 ; Single shoulder strap with an adjustable buckle. Shoulder drop: 11 1/2 length. Front and rear zip around compartments. Two front flap pockets with a single zip pocket. Signature hardware details. Top zip closure. Interior lining with a back wall zip pocket. Dust bag is included.